Integrity Gasket :Width 1.5 in., Length roll 100 ft.
Our Integrity Gasket tape is more than just joist tape -- its unique properties provide acoustical separation, reduction of impact noise in floors and ceilings, and excellent thermal separation in exterior walls, basement floors and ceilings. It can be applied between wood or metal framing members, sub-flooring, exterior sheathing or gypsum board. Integrity Gasket is a 1/8" thick, 2 1/4" wide, self-adhesive, closed-cell, Poly-Vinyl foam tape with a strong water-based adhesive on one side, and a smooth, durable Mylar coating on the other. Integrity Gasket contains trace amounts of biocides that resist mold and fungi growth. 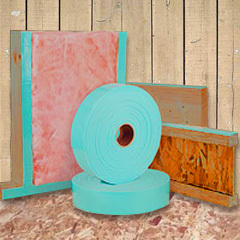 Stud & Joist Isolation Gasket Tape provides a unique soundproofing and thermal break for both residential and commercial applications. Gasket Tape is a closed cell, pressure sensitive adhesive PVC tape. The top surface is a slick and sturdy plastic material and repels moisture, mold, mildew and is non-biodegradable. Insert between wood or metal studs or joists & exterior sheathing, interior gypsum board or sub-flooring. 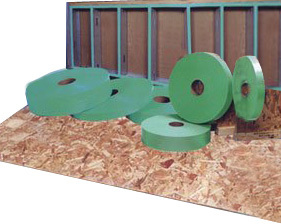 The unique properties of Stud & Joist Isolation Gasket Tape will provide both acoustical separation from airborne noise and impact noise; reducing noise transfer in floors and walls while providing an excellent thermal separation. When used in interior wall applications Stud & Joist Isolation Gasket Tape can reduce airborne sound transmission through walls by as much as 19 decibels. In floor installation application Stud & Joist Isolation Gasket Tape can reduce impact sound transmission (ICC) up to 10 decibels. When interior walls intersect with a grid ceiling, there is an acoustical space at the intersection, which allows noise to jump the wall. This problem is easily remedied by using Isolation Gasket Tape around the perimeter of the Grid Ceiling. Integrity Gasket's are easy to install and require no outside assistance. For more detailed instructions please review our installation manual.